Time for something less rich after all the Christmas excesses. So half a bag of salad leaves, some celery, spring onions, tomatoes and left over turkey breast cut into chunks. 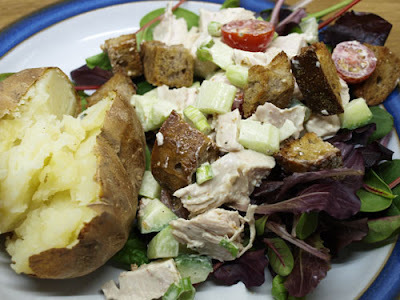 Add some croutons made with left over walnut bread (highly recommended) served with a baked potato. Hmmm probably more of a chef's salad than a Caesar, but I did dress it with Mary Berry's Caesar Salad Dressing which is the best bought dressing I've tried. Perfect dinner! Even the simple baked potato is looking really tasty! This does look like a perfect post Christmas meal. Yum! Hope you had a wonderful Christmas! Oh I'm with you on Mary's Caesar dressing! I was really disappointed when Sainsburys stopped doing it. Lakeland does it though and there's now one near me! My sort of salad - yum! I agree that this looks like a lovely change from all the big, heavy meals - good idea!